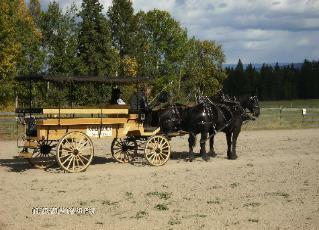 North Cariboo Draft Horse & Mule Assoc. A club for driving enthusiasts of all sizes of equines. We host clinics, workshops, shows and driving events. Our AGM is usually finished off with a sleigh ride in the fields and a great meal. Watch for various members in local events such as the Billy Barker Days parade, the Fall Fair and various driving events out of town. Membership Fees are $10 individual, $12 for a family & HCBC Membership is required. FALL FAIR: Sept. 19th & 20th...at Alex Fraser Park - watch for the Draft Club displays and demonstrations throughout the weekend.